Light Space & Time Online Art Gallery is pleased to announce that its October 2015 art exhibition is now posted on their website and ready to be viewed online. The “SeaScapes” theme as considered for inclusion in this exhibition was art with scenes of coastal living, ocean activities, seaside vistas or any related seashore subjects. Representational or abstract art on this theme was accepted. An art competition was held in September 2015 from which art was judged and selected for this exhibition. The gallery received submissions from 18 different countries around the world and from 27 different states in the U.S. Overall, 419 entries were judged for this art competition. Congratulations to the artists who have been designated as this month’s category winners, along with the winning Special Merit and Special Recognition artists. The gallery commends all of the winning artists for their artistic skill and their creativity. This online art exhibition is indicative of their creativity. 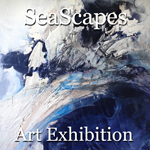 To proceed to the gallery’s “SeaScapes” online art exhibition follow this link https://www.lightspacetime.com/seascapes-art-exhibition-september-2015/.